A Green Heron came flying in to the Main Pond, spread its wings, raised up its head feathers, and landed on the dead willow snag at the north end of the pond. For a moment it stood there, gloriously stretched out, tall and imposing. Then the bird shrank down its neck and slumped into the more familiar shape of hunched-up heron. Its slump was not mine, however. Not for it the fruitless contemplation of the pointlessness of life. Nihilism? Existential angst? Metaphysical mysteries? Pah! That heron was there to fish. Meaning is something we create ourselves. It’s original in each of us, and under our control. We can tell ourselves our own happy little story, or a sad one, for that matter. We can change the story as we ourselves change, or as we wish to change. Because we supply all the meaning to the events in our lives, we can actually change the past – not the events, but the interpretation, the lessons; in other words, the important stuff. We don’t have to stay stuck in the same place, ever. Attitude is everything. 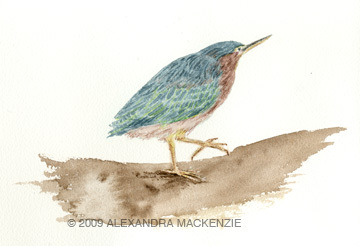 When I watch the Green Heron on the ugly pond, I can tell many stories about it, each one with a different meaning. One of my favorites is, “This is the story about how the Fill is a symbol of great hope.” The Fill was a dump once, but now it is the home of this most fabulous creature, the Green Heron. It means that humans can mess up the world, but humans can also ﬁx up the world. It means that I can make a difference – I can choose to help ﬁx things, as I did when I pulled [invasive weeds} from the base of the very tree that the heron was perched on. One April morning, I was down at East Point, looking at two Pied-billed Grebes in the Cove. Pied-billed Grebes are one of the most common birds at the Fill. They are nondescript divers who look like brown ducks with pointy beaks, although they are not ducks at all. Pied-billed Grebes are actually more closely related to flamingos. Unlike their more flamboyant relatives, however, Pied-billed Grebes don’t catch the eye. 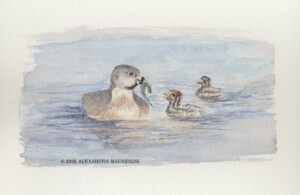 Their plumage is a low-key combination of gray-brown tones somewhere between soot and mud. In the spring, when other birds deck themselves out in bright colors, Pied-billed Grebes barely change at all – a little black under the chin, a black stripe around the bill, and that’s about it. Ho-hum. The behavior of Pied-billed Grebes is just as low-key. [They] paddle calmly around on the lake and ponds, occasionally diving for fish. Sometimes instead of dipping headfirst into the water, they squeeze out the air trapped in their feathers and slowly sink like a submarine. The operative word here is “slowly.” Pied-billed Grebes lack the bon vivantness for drama. So it was with only passing interest that I noticed the Pied-billed Grebes…in the Cove this day. Then I saw that these two grebes were behaving oddly. They had stretched out their stubby necks as far as they could reach, and they were circling each other slowly, keeping their bills together. They looked like a living compass, drawing a circle on the still water – their bills were the point, their tails the pencil-line. I realized that the grebes were doing their mating dance, a sight seen rarely by most birders, and by me never before. A few weeks after I saw the grebes dancing in the Cove, I returned to Union Bay to find a little flotilla of baby grebes paddling in the wake of their parents. There was nothing ho-hum or nondescript about these babies. Their heads were striped black and white like zebras. A dramatic chestnut slash accented their napes. Their bills were a pastel pink, wide open and peeping in hunger. No longer were the adults parading slowly like floats on the bay. No time for that anymore. While one stayed on the surface guarding the babies, the other adult was underwater hunting for fish. No sooner was one baby filled than another demanded something to eat. Who knew that grebes could hunt so fast, or be so endlessly fascinating? The ordinary had transformed itself into the extraordinary. In the world of birding, such surprises are always possible. So, too, in all our worlds. Today, the junior wren I call the punk rocker tried out his latest song. He reminds me of a punk rocker because he still has a few tufts of down sticking up on his head, like a teenager’s mohawk, or maybe an emo mullet, or perhaps even dreads – anyway, some kind of rebellious style sure to make a mother weep. 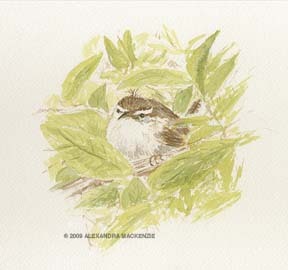 Because Bewick’s Wrens’ songs are so variable and do not seem to be predetermined by instinct, developing one’s own song has got to be tough for each wren. At least, it has been for the punk rocker. He’s been working on his song for about a week now. As do many music students, he started out by singing an abbreviated solfege, but he cut it off after only a few notes. Evidently, something was lacking. A few days later, he was singing a longer song, but I have to say it sounded rough and unmusical. I spied him in the bushes with his head thrown full back. He was giving it his all, but I’m afraid the critics, had there been any in the audience, would have panned him. Today, though, he had a breakthrough. I was passing by his favorite bush when I heard the most beautiful, complicated song I have ever heard… I stood still to listen. The song went on and on, with Bach-like variations on a theme. I tried to find the singer, but he was too well hidden. At last, he reached the grand finale and stopped. There was a little rustle of leaves, and a tiny, tufty head peeked out for an instant, then slowly withdrew. Bravo! Bravissimo! I waited there, hoping for an encore or at least a curtain call, but the maestro was done for the day. Why try to outdo perfection?